A child is a gift from the Creator. In Native teachings, birth is a symbol of awakening, emerging, changing and new beginnings. That is why the creation of life is sacred: a baby is beginning the journey of life and is a gift of the Spirit to parents and the community. When a baby dies, it is a tragic event. Sudden Infant Death Syndrome (SIDS) – which occurs when an apparently healthy infant dies suddenly and quietly as he or she sleeps – is especially hard to understand and cope with. SIDS is the leading cause of death in Canada for infants between the age of one month and one year. Also known as “crib death” or “cot death,” SIDS strikes one in every 3,000 babies. A seemingly healthy infant falls asleep in his or her crib, stroller, car seat or parents’ arms, and never awakens. No signs of suffering are associated with the death. Sadly, First Nations communities in Canada face at least a three times higher rate of SIDS among their infants. And studies show that while the death rate from SIDS has fallen since 1980 in the general population, it remains high among Aboriginals. 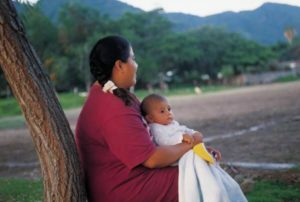 Aboriginal mothers aged 19 to 24 have a 6.5 per cent greater risk than non-Aboriginal mothers of losing an infant to SIDS. A University of Calgary study found that Aboriginal babies in Alberta were 10 times more likely to die from SIDS than non-Aboriginal babies. In Saskatchewan, the SIDS rate between 1982 and 1994 was 5.5 per cent higher among Native infants than among non-Native infants. A U.S. study from 1992-1996 reported a SIDS rate of 19 per cent per 1,000 Native American infants, compared to nine per 1,000 in the general population. Risk factors for SIDS in this study included over-bundling, lack of prenatal care, lack of post-natal care, poverty, and smoking and drinking alcohol during pregnancy. It is important to remember that SIDS is not the parent’s or family’s fault. The cause of SIDS is unknown. While we know ways to reduce the risk, we do not know how to prevent SIDS. Parents should not blame themselves. The death is NOT due to poor parenting or to a lack of physical, emotional or spiritual attention. It is normal for parents to feel sad, confused, or angry. They must be reassured that they are not alone. Those who lose a baby to SIDS can consider speaking with people in their community – a medicine man or woman, clan mothers, elders or someone else known for advising and helping. Other parents who have also experienced a child’s death may be able to listen and understand the pain. A grieving ceremony or other such ritual can help remember and honour the baby and its spirit, which came briefly into this world. Parents’ grief may be complicated by the common misperception that SIDS risk factors are the actual cause of SIDS. They are not. But people may believe that if the baby was sleeping on its stomach or was bottle-fed, or if there was smoking in the household, these must have “caused” SIDS to occur. A well-informed and compassionate health care worker or Baby’s Breath member can explain this to a grieving family, and help them reduce risk for a subsequent baby. It is important to remember that there is a low rate of recurrence of SIDS within a family. Download the SIDS brochure LOOK UP to our Ancestors – Whisper “look up to our ancestors” when you put your baby down to sleep. This will remind you to place your baby on her/his back to sleep, and so help reduce the risk of SIDS. This section was provided by National Indian & Inuit Community Health Representatives Organization (NIICHRO). For more information please visit the NIICHRO website.